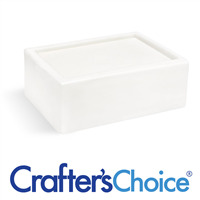 Crafter’s Choice Three Butter Melt and Pour Glycerin Soap Bases contain the triple action moisturizing properties of shea butter, cocoa butter, and mango butter. They are available in Detergent Free and Signature. Buy Detergent Free for its gentle cleanse and creamy bubbles. Buy Signature for its cleansing power and big bubble lather. Three butter soaps are opaque white, and made in the USA.